1 hour and 45 minute instructional DVD. Includes nine 12 inch block patterns, demonstrations of five different applique methods: Sizing or starch, needle turn, freezer paper method, raw edge fused and machine applique. Instructions for " Song Birds in Summer" with supply list included. See the "new" method that replaces the Freezer Paper method under the Combi pack in the Applique tools section of my web store. There is a free video to update you on this great new method of turning edges. Bonus segment- How to add shading, high lights and shadows with fabric crayon paints. Shading adds extra dimension to all your pictorial objects. You will not believe how easy it is to enhance the look of your flowers and birds. Create a nest for the baby birds using an embroidery hoop, some nesting material and thread. This fun technique can be used to make lots of embellishments for many quilts and blocks. Place the DVD into your DVD player and watch the video on your TV screen for amazing details and clarity. 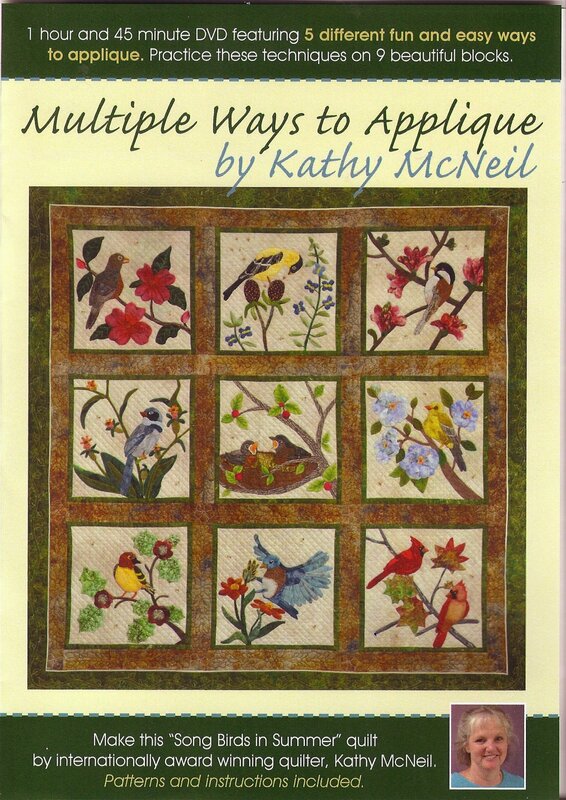 You will feel like you are right next to me as I am teaching you to applique with all the tricks and tips that I have learned over the last 16 years. Thank you for sharing my passion for APPLIQUE! To find your patterns and instructions on a movie DVD you will need to......Pop this DVD into your computer. Do not play the video player. Instead open theDVD icon on your desktop to find three files. A video file, an audio file and a DVD Rom contents file. Open the contents file. Print out your PDF patterns. Take them to your copy center. Ask them to enlarge them 150% for your 12 inch block pattern size. If you have trouble finding the DVD icon and opening the file with the patterns, take the DVD to your copy center. Ask them for their help as they will be enlarging the patterns for you. There should be no charge. The only way to add PDF or picture files to a DVD is to add them to the contents file. Technology is great but sometimes more complex than it should be. If you have any trouble, please just e mail me and I will e mail you all the pattern and instruction files to get you started. This is a short introductory clip.